Before I transformed my laundry room last year, I dreaded doing laundry. 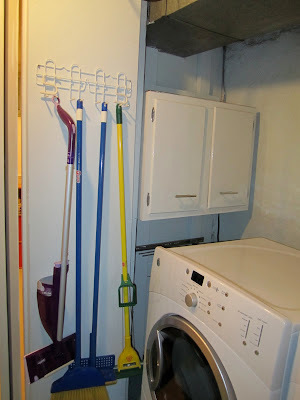 Aside from the obvious reasons that laundry is, you know, a chore, my laundry room was ugly and not well-organized. And you know me: if a room is not pretty and not organized, I'm not spending much time in there. A lot of the laundry room eye-candy (I swear: this really does exist) I saw and loved had detergents hidden away or in gorgeous, swoon-worthy glass jars. But unfortunately, that didn't seem practical to me. So I decided to keep my detergents out, but do so in a kind of pretty way. I had this long black IKEA console table from about 14 years ago and it has traveled with me from apartments to this house. It works perfectly in that space: the dimensions are just right, it's just the right height and it is nice and sturdy. The top was in rough shape and kind of peeling, so I just used some of the pretty blue polka-dotted Contact Paper left over from my playroom project to cover the top. I had this large bright green plastic basket from Target already and put the detergents in it. That's all I leave on the table. Behind the table, I hung a plastic holder for the ironing board and iron. Love this! It keeps both things off the floor and out of the way but they're a snap to access when I need them, which is usually for curtains or pillows. I hung the $.70 artwork from Marshalls on this wall too. I think art in a laundry room is a really good idea. It makes me smile when I go down there ... probably in large part because it was so cheap! This wall-mounted cabinet was in the laundry room when we bought the house. 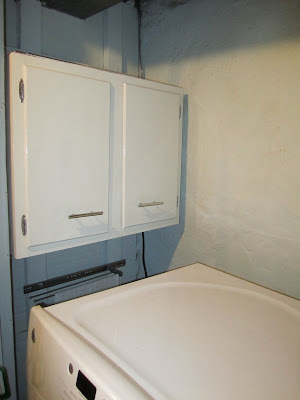 I think it used to hang in the kitchen before the former owners updated the kitchen: it is metal and matches several cabinets out in the garage. It was a little dingy, so I updated it with a coat of oil-based high gloss Rustoleum metal paint that I had on hand and new, modern hardware. I love how it looks now - both inside and out! Inside the cabinet, I added the same Contact Paper on the table to the shelves. They were a little worse for wear and I like the fun pop of pattern inside the cabinet. I had some small baskets left over from a set of nesting baskets that I bought, so I put them to use to organize things. On the left top, I have our stain sprays and sticks in one basket. On the left bottom, I have a little metal bin I found in Target's Dollar Spot to hold our washing machine freshening tabs and lint traps for the utility sink, a little measuring cup and a small glass jar to hold change that turns up. On the right, I store seldom-used things like bleach and Borax and some pest control things. On the wall next to the cabinet, I hung a mop and broom organizer, and this is where I store all of those things. They're out of the way but easy to grab when I need them. One thing I desperately wanted in my laundry room was a little drying rack for lingerie. I saw one at Ballard Designs that was a little too expensive and even found Centsational Girl's tutorial on how to DIY the same thing, but there just wasn't enough space in my room to fit one. 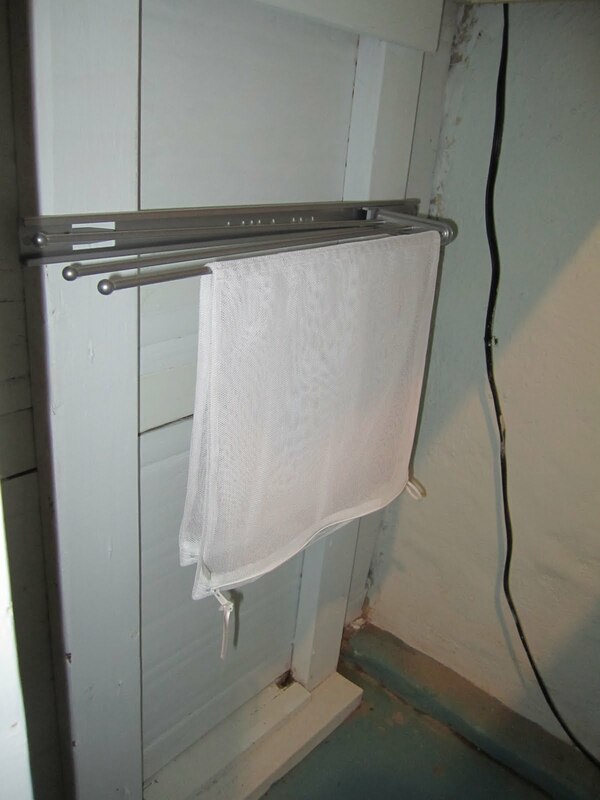 I found my solution at IKEA: it is designed as a towel bar for under a sink or in a cabinet. I loved the slim profile and price (I think it was less than $10). 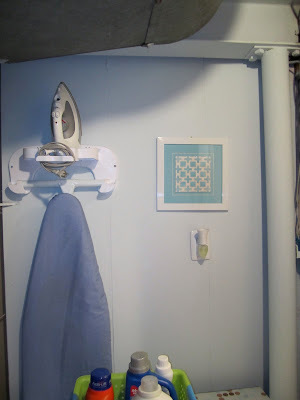 I mounted it under my wall cabinet and store the lingerie bag there and use it to drip-dry delicate bits of laundry when necessary. It works perfectly for my needs. Finally, I use the walls of the laundry room for storing extra folding chairs. Before, we had the chairs kind of propped up against the walls on the floor. This drove me crazy. So I found some red hooks designed to hold bicycles in garages and mounted them to the studs in the walls. I hang the chairs on them. 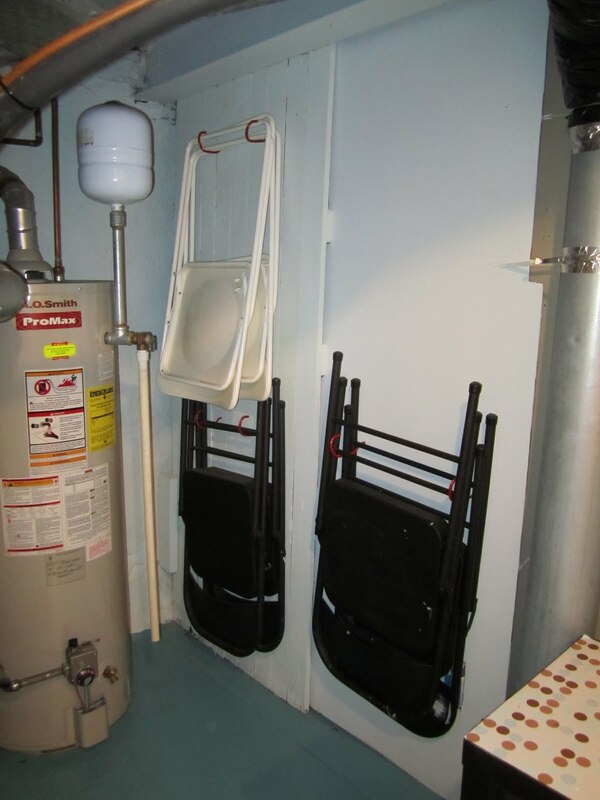 When we need the chairs, it's easy to get them but for the most part they are neatly stored off the floor and out of the way. I love making use of every square inch of space! There you have it! 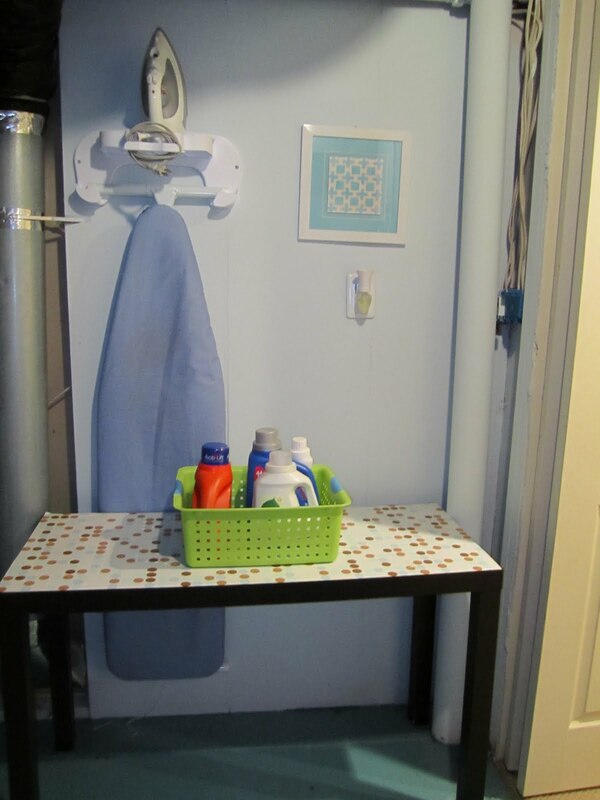 Some organizational solutions to keeping a laundry room neat, tidy and organized. What's your laundry room like? If you need any organizational tips, let's talk about it and air our dirty laundry (room secrets). hahahahahaha. love it! can you tell me what the paint color on the floor is? 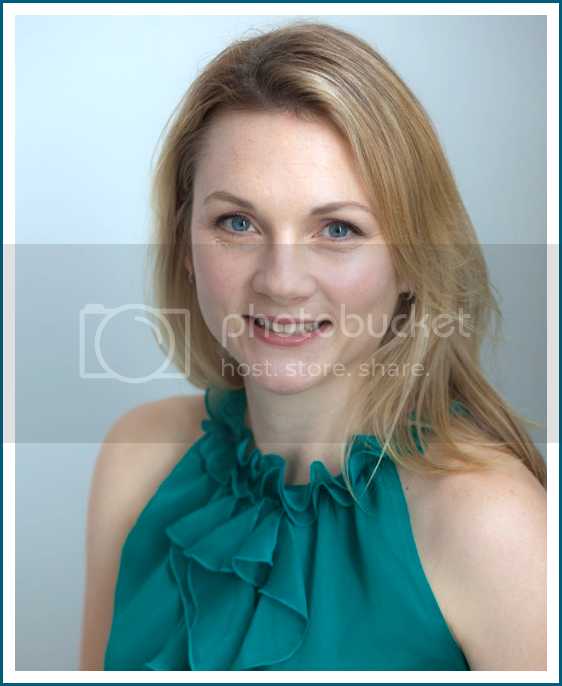 Hi Mandie! The paint on the floor is "Cloudburst" by Sherwin Williams. It's their Porch & Floor enamel and is water-based. I'm already noticing it's starting to scuff in places but not so badly that I'd not use the paint again. I like working with water-based vs. the oil!